This 3 m long dinosaur bunting makes for very easy and effective party decorating! SKU: 45-1202 Categories: Green, Bunting Flags, Garland, Dinosaurs, ON SALE! 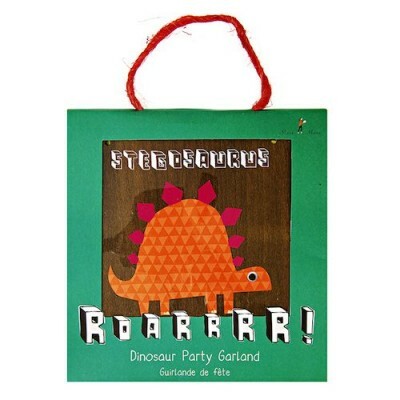 Our Dinosaur Party Garland from Meri Meri is a great way to turn your party space into a jurassic scene! It features a host of different dinosaur pennants, including information about them, along with lots of jungle leaves which are all threaded onto bright rafia ribbon. This dinosaur bunting would look neat strung across a party space or on a wall above a party table. You could team this up with balloons in yellow, orange and green to complete the look. Some easy assembly is required – you simply need to thread the pennants onto the rafia ribbon.